Don't forget about Mom this Sunday! Stop by Spring Ledge Farm for some ideas. 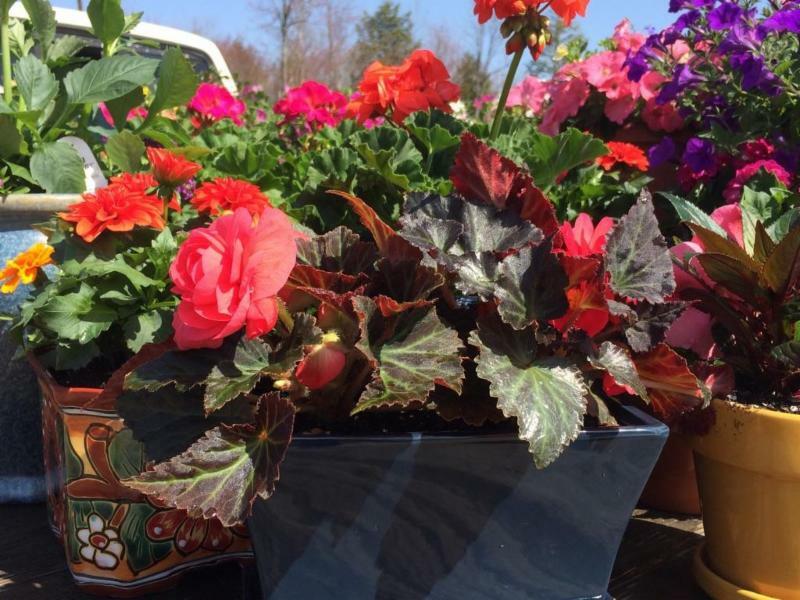 They have all sorts of plants for mom, from fruit trees and blueberry bushes to hanging baskets, geraniums, tropical mandevilla, herbs, perennials and flowering shrubs. They offer kid-sized (& kid-priced) pots of basil, marigolds and alyssum. We have beautiful hanging baskets grown using organic soils and beneficial microbes and good bugs. They even add a long term organic fertilizer to the hanging baskets for a season-long food source. They've created combinations of ceramic pots and flowering annuals that look great and will last all season. Hardy Japanese maples, forsythia, azaleas and rhododendrons are in stock and looking great. Planting one of these for mom results in a lasting memory and something to enjoy for years. Spring Ledge has bags of compost and local earthworm castings to add nutrition and soil health to the planting. Or let mom choose exactly what she wants with a gift card to Spring Ledge - available in any denomination. And the best part of shopping at Spring Ledge Farm? Their great staff to help you choose from all the available plants and pots. They are open Mon-Sat 9-6 & Sunday 9-4. Stop in early to beat the rain! Take a walk around New London and you're apt to see the "Pumpkin People" sprouting up all over the town! We're all having a little fun and friendly competition. The Town's Rec. Department will be judging the new pumpkins in town on October 25. The contest is open to all residents, businesses and organizations. Click here for more information. Have fun making your people! Meet our new family - another satisfied buyer who bought from "The Best Team in Town"! Teamwork from the Team that works – Coldwell Banker Milestone Real Estate. Making Soup for those Chilly November Days? Friday Nov. 7th 12-5:30; Saturday Nov. 8th 10-1; Friday Nov. 14th 12-5:30; Saturday Nov. 15th 10-1; and starting Monday, Nov. 17th, they will be back to full time, seven-days-a-week of farm fresh goods and natural holiday decorations through Christmas! Stop by in the morning for their homemade cider donuts (beyond yummy!). This year, Spring Ledge is also offering free range turkeys from Misty Knoll in Vermont. Place your order and you can pick up your turkey on the 24th or 25th of November. Price is $5/pound. Spring Ledge Farm is located at 37 Main Street, New London, NH. Ready to Get Your Flu Shot? The Lake Sunapee VNA & Hospice is offering flu clinics to the public. Some insurance companies are billed, or the cost is $25. Please bring your insurance card. Listed below are the upcoming dates and locations. Stay healthy! Come out to "Stuff the Cruiser" this Saturday, July 5th outside of Hannaford's Supermarket in New London, NH. Stuff the New London Police Department's cruiser with food to benefit the KLS Community Food Pantry. You can drop off a donation or purchase something at Hannaford's. Everyone donating will receive a raffle ticket toward winning some great prizes. The cruiser will be there from 10am-4pm. Come on down and support a good cause! Interested in Our Water Resources? The 2014 New Hampshire Water and Watershed Conference will be held on Friday, March 21, 2014 at Plymouth State University. This year, the theme is Sustainability of New Hampshire’s Water Resources. Click here to find out the details. Looking for Fresh, Locally Grown Veggies? Want to Know What's Happening in the School District? All Pumpkin Racers must design and race their Pumpkin Races according to these few important rules to ensure that the Pumpkin Race is fun and fair for everyone. RULE #1 Craft your Pumpkin RaceCar using a single pumpkin. RULE #2 Insert two independent axles through your pumpkin and attach wheels to the axels. Spice up your racer with style. RULE #3 You may not attach your pumpkin onto a pre-fabricated chassis of any kind (skateboard, stroller, Tonka truck, etc., etc...) A.K.A. The "Anti-Stealth" Rule. RULE #4 NO EXPLOSIVES or PYROTECHNICS. RULE #5 No pushing or "helping" your Pumpkin Racer on the starting line. Our Race Officials have seen it all - the last minute shove, the hidden thumb flick, the early release, the remote control chassis, etc. etc. See Rule #6. Congratulations, Pumpkin Racer. Get out and enjoy the fun! Are You Concerned about our Military Veterans? Come have a conversation with Dartmouth College President Emeritus James Wright at the Tracy Memorial Library on Wednesday, October 23 at 7pm. This program is sponsored by The Friends of Tracy Memorial Library and is free and open to the public, RSVP appreciated 526-4656 ext. 1. The program will be followed by the Friends' annual meeting and election of officers.